Next, look at the tongue height. 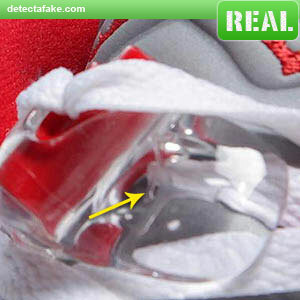 As you can see in the real one, the tongue height, after the cut out, is very close to the top of the shoe. The fake one is much lower. It should extend up to the yellow line. 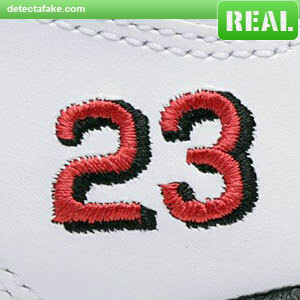 Not all of the Jordan 5 retros have the "23" on the side, but if your shoes do, look at the space between the "2" and "3". 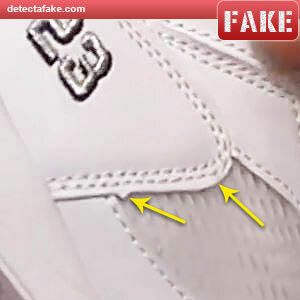 The real ones have a clear gap between them, while the fake ones are often connected with sloppy embroidering. 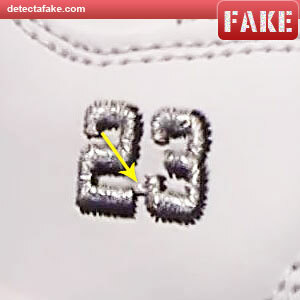 Next, look at the jumpman on the back of the shoe. 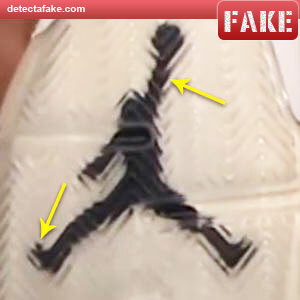 Notice on the real one, the jumpman's hand looks much flatter and the fingers are uniform. 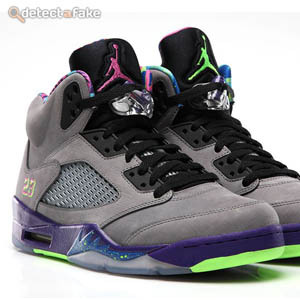 The fake one looks much lower in quality and should be very obvious if you're looking for it. 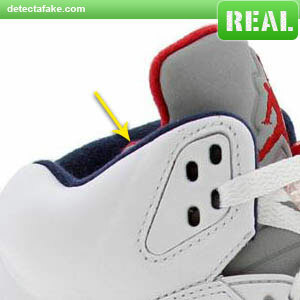 Next, look at the position of the jumpman on the back of the shoe. 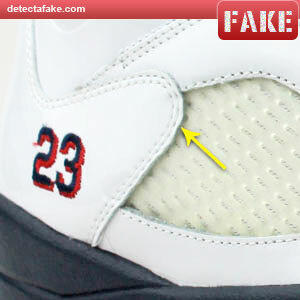 Notice on the fake, the space between the jumpman's feet and the sole is about 3 times as much. 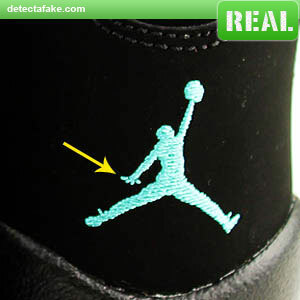 Next, look at the height of the jumpman on the tongue. Notice on the real one, there is a clear space between the top of the outline and the top of the tongue. 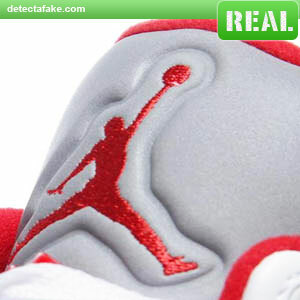 On the fake one, the top of the outline is actually gone and the ball reaches all the way to the top of the tongue. 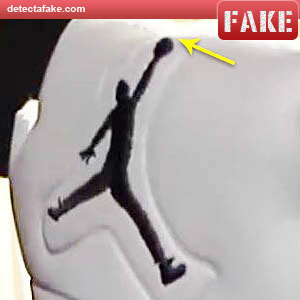 Another thing that is wrong with this fake is the positioning of the jumpman inside the outline. The fake one looks much too high. Next, press on the side cushion. 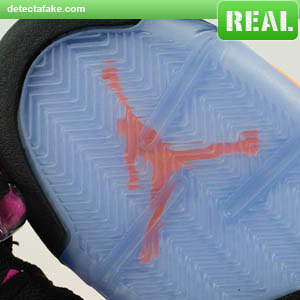 An authentic pair will return to the original shape quickly when pressed in. 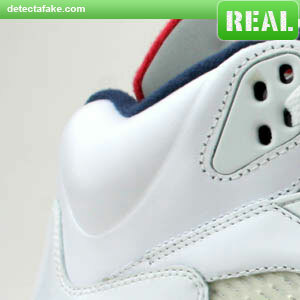 On the fake ones, you can see it takes a second or 2 to return. 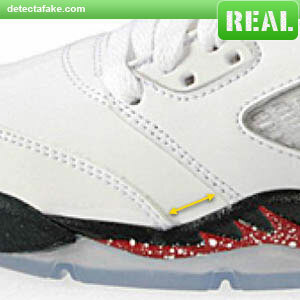 Next, look at the side of the toe box. 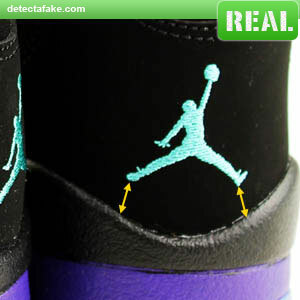 Many of the fakes are much wider between the stitching than the real ones. 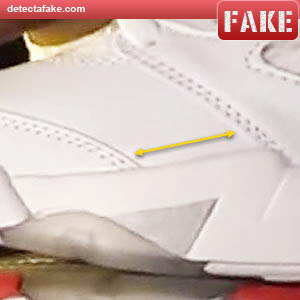 Next, look at the jumpman on the bottom of the shoe. The fake one has 3 issues. Next, look at the lace lock. 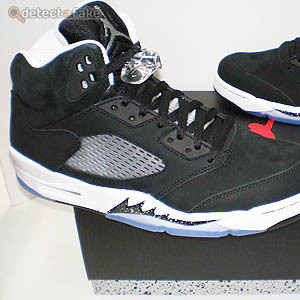 A real one should have the jumpman on it. Many of the fakes have "NIKE" molded in them. 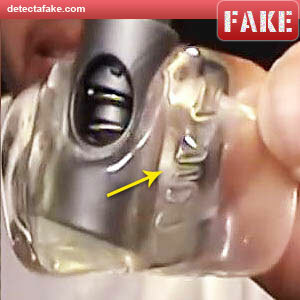 If you see one with "NIKE", it's definitely fake. 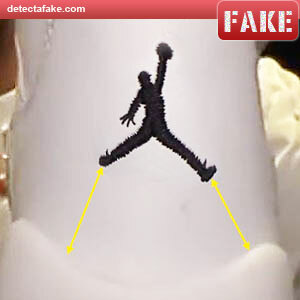 However, if you see one with the jumpman, it doesn't mean the shoes are real. 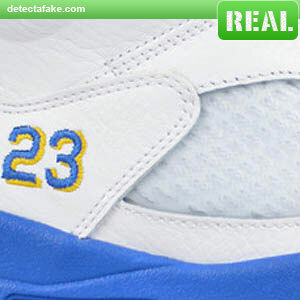 Genuine lace locks are sold on the internet alone, so fake shoes can have genuine lace locks. Make sure your shoes pass the other steps too. Another thing to look at is the quality of the stitching. 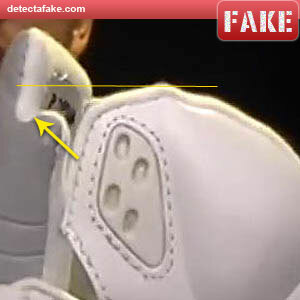 Look at the fake one and you can see extra material beyond the stitching. This area should be very uniform an consistent. Here's another example of poor quality stitching. Notice the uneven waffle look along the stitch line.